Philippine Airlines Promo 2019 - 2020: Pal introduces new flights from CEBU! 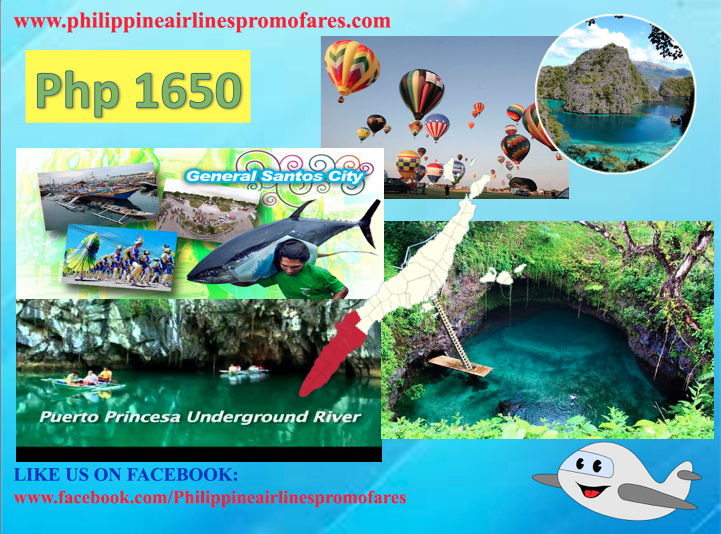 For as low as Php 1627, from Cebu, you can now fly to General Santos city, the TUNA capital of the Philippines. For the rest for PAL plane fare ticket is set at Php 1650 going to Puerto Princesa where you can have an underground river tour which is one of the Seven Wonders of the World, to Coron, it's also an island in Palawan with lots of tourist attractions, and definitely, have you heard of the Enchanted river in Surigao? That's one of the perfect spot to discover as well in the province. Travel with us and enjoy free baggage allowance and free snacks, ample legroom and heartfelt service. Plus, get to save on time and others costs as we take you more conveniently around the Philippines from Cebu! FARE CONDITIONS: Fare is inclusive of government taxes and fees, ticketing service fee, and surcharges. For Domestic Budget Economy, fares are valid for one-way and combinable for roundtrip travel. Ticket is refundable with a refund fee of Php 1,500 per sector inclusive of 12% VAT, Change fee of Php 1,500 per sector inclusive of 12% VAT and fare difference. Ticket is considered No Show if ticket is not reissued /refunded at least 4 hours prior to flight departure or if passenger fails to check-in on time. No Show/Non Users fee of Php 1,000 per sector inclusive of 12%VAT. For ticket reissuance, upgrade to next available higher fare. Downgrading to lower fare amount not permitted. Infant without seat fare is 10% of adult fare. With mileage Accrual of 50%. Book and Buy, seats are subject to availability, other travel conditions apply. Mobile device booking now accepts Mastercard and Visa. BAGGAGE ALLOWANCE: Fare is inclusive of 7-kg handcarried baggage and 10-kg free baggage allowance. This is great news plus you have given details of everything which makes it so easy for customers. Thank you very much.